Somewhere in the push-pull between blue skies and grey hearts, the thing we like to think of as summertime 2018 is finally, for the most part, here. There will be gigs on porches and gigs in basements, there will be packed nights in clubs and rainy days in fields. And that’s just this weekend! For real though, as our musical agenda starts to fill up here in Philly, heading into the equinox and beyond, let’s not forget about the unknown. The songs and sounds we haven’t heard yet that may occupy a big portion of our listening in the coming months. Here are six standout Philly releases I found on Bandcamp this month — some are out in full already, some are just teasers for projects that drop in June — and they run the range from blown out head trips for stormy afternoons to sidewalk chalk speckled romance in the form of classic soul connecting with retro-futuristic rock. Dig in below, and always remember to keep extra space on your playlist. 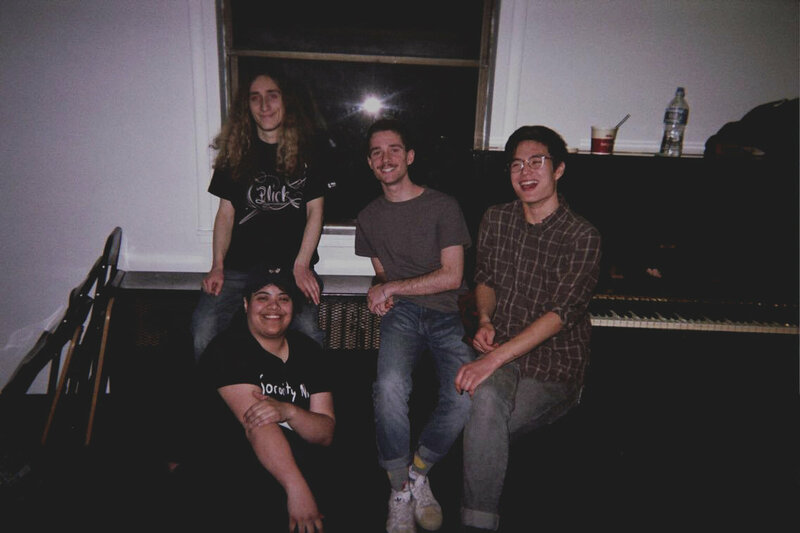 In the spirit of The Spirit of the Beehive, new Philly band They Are Gutting A Body of Water is able to find a glimmer of light and hope in an otherwise grey, dismal world. Guitars moan, drums glide at a lethargic pace, and a voice from singer-guitarist Douglas Dulgarian pines “Today I saw the sun, but it was temporary.” But in the fuzz and fray, beautiful lead melodies sneak through, and hopeful chords ring out — both of which we hear towards the conclusion of “Yawner,” the penultimate track on the band’s new LP Gestures Been. Comprised of Dulgarian with Ben Opatut on Drums, Evan Moffitt on Bass and Michael Doherty contributing keys, They Are Gutting A Body of Water recorded much of the album at Big Mama’s Warehouse — Spirit’s home base — with engineer Chris Baglivo. Maybe a bit of the influence rubbed off, maybe it’s just a case of minds meeting. Whichever it is, this is a set of perfect sounds for grey days. First and foremost, I have to give West Philly punk trio Bike Crash serious props for modeling the cover of their new album Surprise! on the cover of the 1972 Philly classic Backstabbers by The O’Jays. The nod is very much rooted in the band’s mission statement with their first release since 2013 — to create a “time capsule of modern Philadelphia.” As their Bandcamp liner notes say: “It reflects the Comcast skyscraper(s), the power lines & grocery stores and takes a scalpel to the infamous 2015 closing of the Edward Bok school & its mutation into a bar for the gentry.” Surprise! comes out on cassette on June 10th, and the band is streaming “The Plunge” right now. The song covers a lot of territory in two minutes and change, with several sonic shifts and lyrics that allude to objectification and social anxiety. I am a sucker for a good gimmick, and when you call your band My Sister’s Fugazi Shirt and record songs called “The Part In The ‘Such Great Heights’ Music Video Where They Turn Up The Emo Knob”…okay, you got me, I’m paying attention. It’s a weakness, absolutely, but this band makes succumbing to it not such a terrible thing. The project of one Ryan Naglak, who records everything — guitar, bass, vocals and drum progamming — MSFS released the Double Date EP last month, and it ranges from sparkling indie-punk drivers (the aforementioned Postal Service-referencing jam) to more contemplative moments like “Green,” which sounds all tender but has a biting undercurrent — “If you think I’m cynical, just wait and see,” sings Naglak. This four-piece is rooted in the loud proud feminist indie rock of the 90s and aughties — Sleater-Kinney and that dog. alike. Baby Bush’s debut Dude, It’s Rude takes down the patriarchy and shares slice of life observations about existing as a nonmale human in Philadelphia in 2018. The EP is rough and raw, but all the awesomer for it; singer Eliana “Jeb Bush” von Krusenstiern has a voice that shakes with vulnerability as much as it roars with confidence and command. Also in the mix are Sophia “Chanukah Bush” Abraham-Raveson on bass, Stevie “Burning Bush” Campos-Seligman on drums, and Emily “Kate Bush” Dombrovskaya on guitar. Speaking of good gimmicks — I love the familial naming convention there. But the thing you’ll remember about Baby Bush isn’t the goofy names, it’s the outlook and anger and energy of the music. It’s not just that the EP is called Summer — it feels summer, between the smooth and swooning songs brimming with sunshiny melodies and the eye-popping cover art, where an image of singer-songwriter Rajule on a bright day is adorned with sidewalk chalk style doodles and lettering. With earnest tones of classic soul (“Diamond Is Not Crash”), modern genre-bridging R&B (the Chance-style duet “Summer,” featuring Makayla), and retro-futuristic rock (“Best Friends?) this heart-on-his-sleeve Philadelphian chronicles the story of a few months’ romance in the warmest season of the year. The latest from the ever-flourishing emo revival scene in the Drexel University orbit, My Name Is Tom make their debut next month with the All Good Things EP — two songs from which are streaming now. The songs race and wail, unpacking feelings of regret: “I’m sorry I wasted your time,” sings guitarist Talisa Garcia on “Something Else.” “I just thought for once maybe I could get things right.” The EP was recorded and mixed by Sleepy Freak’s Ethan Farmer at Drexel Studios; My Name is Tom is also comprised of Nick Schon on bass, Justin Dudzinski on guitar and Sam Baron on drums, and though there’s no word yet on a release party for All Good Things, we imagine it’s coming to a basement near you this summer.